If equipment such as fans – which are an essential part of workplaces, restaurants and residential properties – are not looked after, it can lead to unnecessary downtime and consequential costs for your business, not to mention the risks to Health and Safety. Just a small reduction in usage of a fan in good working order can amount to substantial savings. This is also true of fans operating in smaller casings. If it is not working effectively and equipment failure occurs, this could lead to a potential loss of profits, once the cost of alternative arrangements has been taken into account. Please do ask us about anything else you have, as the above list is not exhaustive and it is likely we can help in most situations. We can also provide bespoke servicing plans to suit your individual needs. 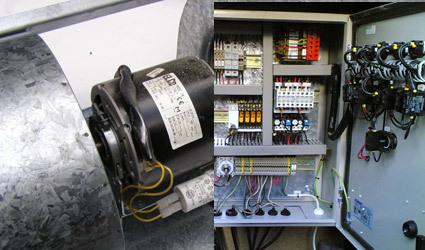 Our expertise extends beyond rebuilding fans, motors or pumps, and continues into their associated controls. This enables us to either diagnose the fault or, advise and install with regards to a new control panel. At each stage of a diagnosis, we will keep you informed of the recommended course of action. Getting to us is easy. We’re located in Ash Vale near Farnborough with easy access to outer North West London, and across the South West to the South East of England. We hold accreditations from SafeContractor, ConstructionLine and CHAS, so you really are in the most capable hands. Contact us now to arrange your visit.